From army forts turned into pirate radio stations and oil platforms converted into micro-nations, the notion of living full-time on the high seas is nothing new. 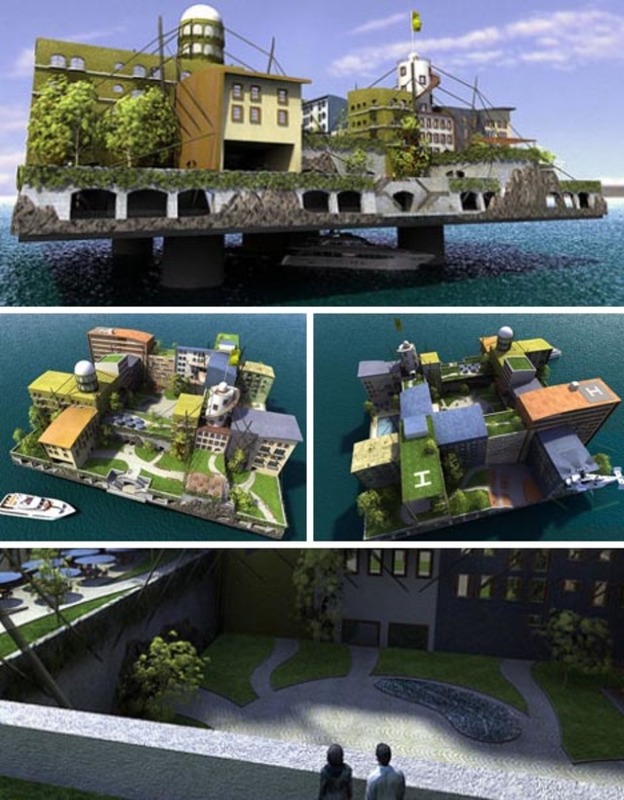 However, these amazing award-winning designs from the recent Seasteading contest float in front of us five jaw-dropping possibilities for the future of urban life on the sea unlike any artificial islands you have ever seen (including this recycled floating paradise island). The winning design is a colorful and vibrant work of imaginative urbanism, depicting a world on the water not unlike life on land with winding paths, city squares, mixed uses and traditional architecture. 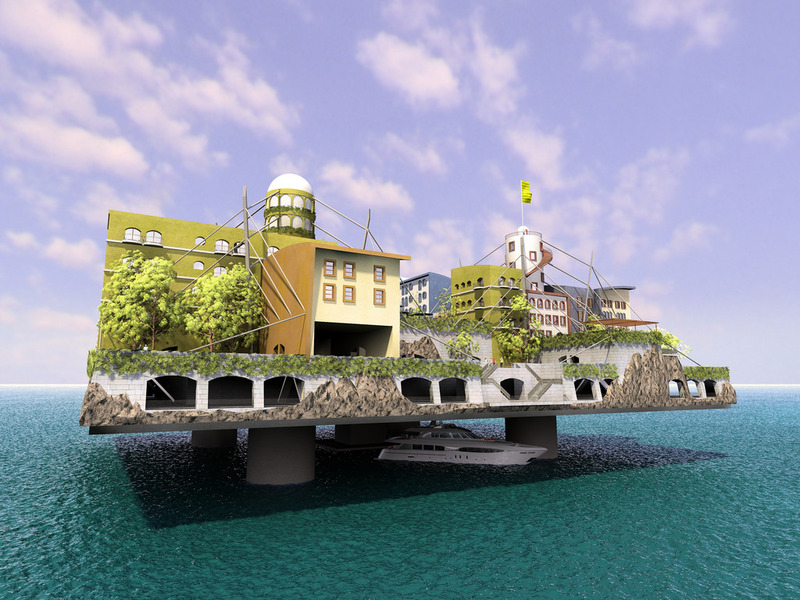 Like a slice lifted from the heart of an old European town this Swimming City concept sits on four pillars with room to pass beneath it and the remnants of its removal showing on all sides. Almost more a luxury resort hotel than a city on the sea, the winner of the best picture award certainly warrants its prize for the compelling visual cacophony of the above rendering. The image shows off tropical beach-like edges with premium condos jutting out to overlook the water and a dense core of mixed-use functions. 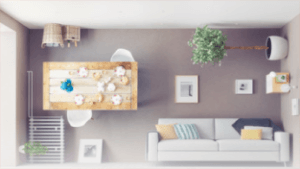 Deemed to have the most personality, this runner-up design is as much about change over time as it is about a fixed work of construction. 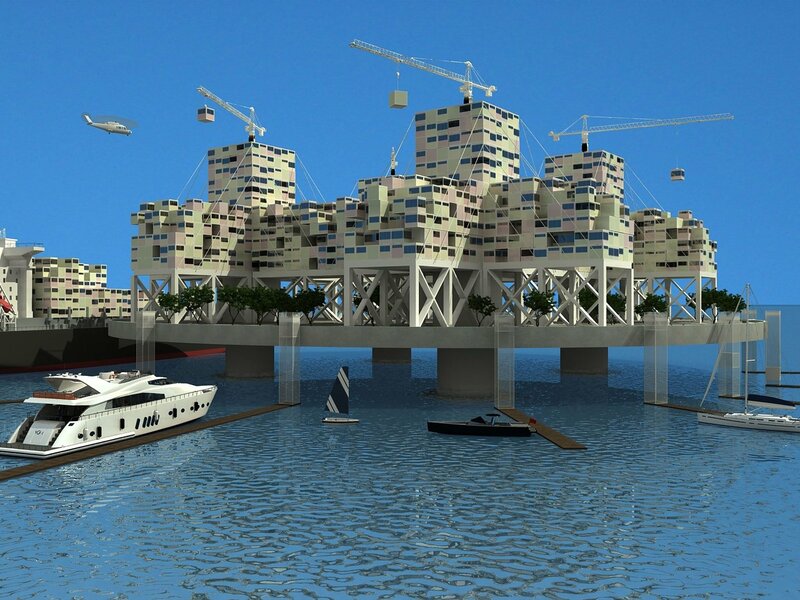 The idea is a simple, modular mixed-use city-on-a-platform that has the freedom to evolve and expand as needed – forever a work of urban design in progress. In the realm of aesthetics this sustainable city design was elected the winner, perhaps in part for the way it shows off its green design strategies in the look of the structure itself. 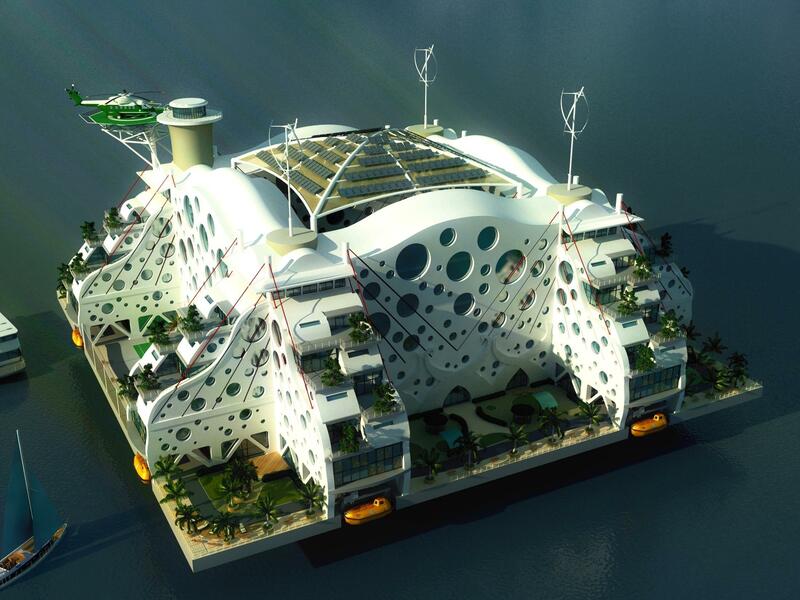 Shaped to channel wind, bring in solar energy and passively cool (as well as feed) the residential population within, this enclosed city structure is eco-friendly in appearance as well as in practice. 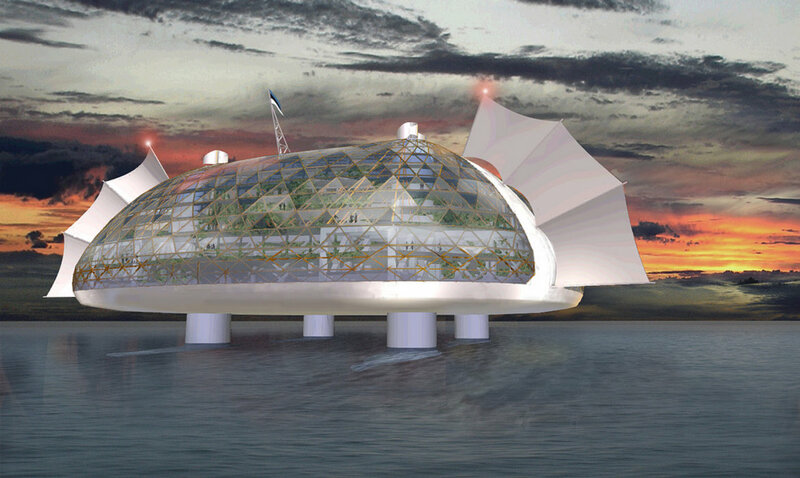 It may be no surprise that this last floating city design won the peoples’ choice award. 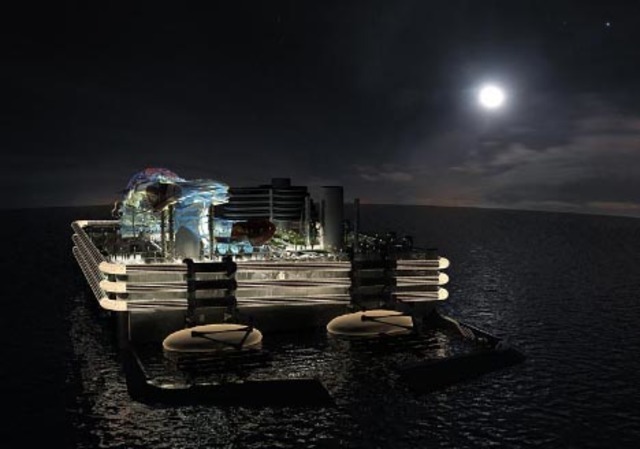 It recalls both the form of a modern city square as well as the oil rigs and other converted architectural remnants of the world’s oceans we have come to associate with creative conversions and liberation from the laws of society and government alike.